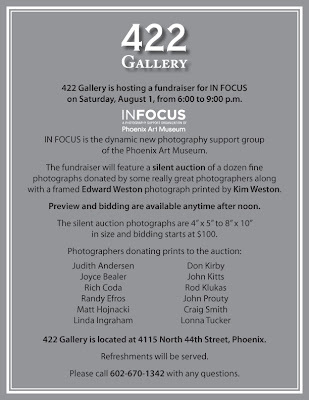 Just a reminder that the InFocus benefit at 422 Gallery is tomorrow, Saturday, August 1 from 6:00-9:00 PM. The images for up for silent auction will be viewable from 12 Noon, in case you already have plans for the evening. 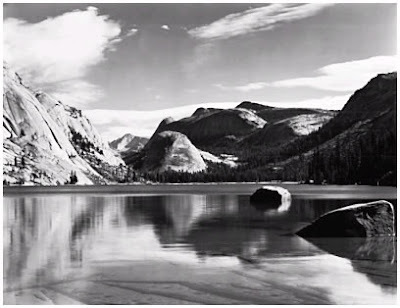 Opening bids start at $100, except for the Kim/Edward Weston image, which starts at $500. Refreshments will be served. Call John Kitts of 422 Gallery at 602-670-1342 for more information. Saturday, August 1, from 6:00 to 9:00 p.m.
of the Phoenix Art Museum. photograph printed by Kim Weston. Preview and bidding are available anytime after noon. in size and bidding starts at $100. 422 Gallery is located at 4115 North 44th Street, Phoenix. Please call 602-670-1342 with any questions. For those of you not familiar with New Jersey, there was a phenomenon back in the 1970s and 1980s called "The Uncle Floyd Show". It was on PBS (for a while anyway), usually after school. To the innocent bystander it appeared to be a children's show, but to the aficionado it was pure adult comedy and satire. They covered topics from entertainment to politics. I watched it when I was in high school. I went to William Paterson my first year of college and some of the cast were continuing students there and you'd regularly see them at the school pub. When I went to Rutgers (in New Brunswick, New Jersey), no one had ever heard of Uncle Floyd. Until I met Charlie Belunis. He was the only one I ever met at RU who was clued in. We started a Rutgers Fan Club (because college students have nothing better to do). Uncle Floyd used to have a segment at the end of each show called "Pictures on the Wall". It was kind of like a refrigerator on TV, where he would post drawings sent in by children from all over NJ. One day, Charlie drew a great impersonation of a child's drawing and sent it in. Imagine our surprise when it was featured in the segment, signed Charles Belunis, age 18! Anyway, I was thinking about my home state the other day and wondering if Uncle Floyd had done anything since the glory days. He is a great Vaudeville/Honkytonk piano player and he is always found playing at a club or restaurant somewhere deep in the heart of Jersey. I found this clip of a series that I had not heard of before, called "Uncle Floyd's New Jersey". I guess once you get a job after college your priorities change. I found it fascinating for I had no idea of the diversity in places like Paterson, and the relative peace within that diversity. Nothing like we have today. Ah, the good ol days. There are several other episodes available on YouTube. Check them out. 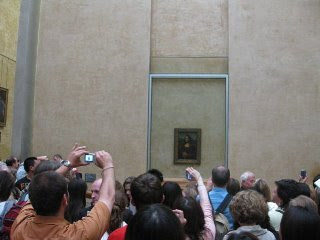 We have decided to spare no expense to bring you coverage of fine-art events around the globe. 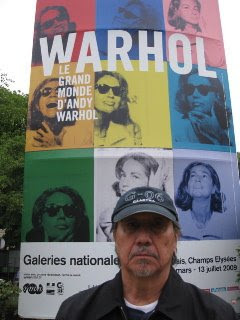 This summer we rented a house in Paris, France and sent our "Man on the Street", the famous Larry Golsh, there for six weeks to report on the Paris art scene. Upon his return we will put him up in a luxurious condo on the 22nd floor in San Diego until we bring him back here to Phoenix in October. 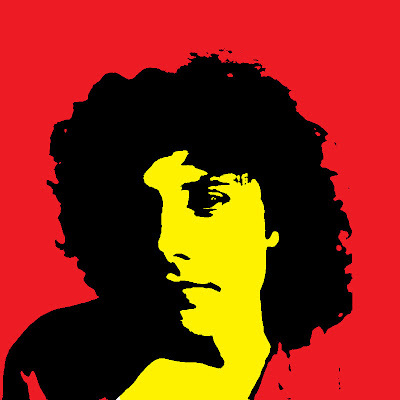 Here's Larry's take on the Warhol exhibit at the Grand Palais. Just going to the Grand Palais in Paris is a great experience, the building is one of the most beautiful I have visited. The Warhol exhibit is spectacular. The paintings took on a new international look for me. 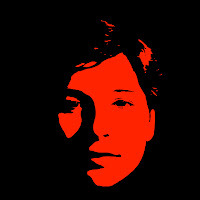 For the first time I realized how important photography was to Warhol. 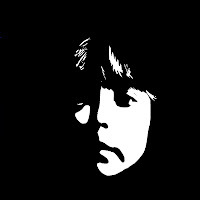 My favorite works were the self portraits and the floating silver clouds. 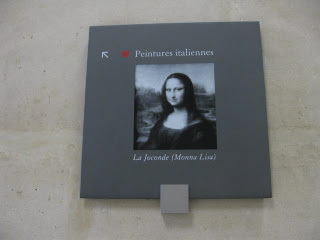 And what trip to Paris would be complete without visiting the Louvre? 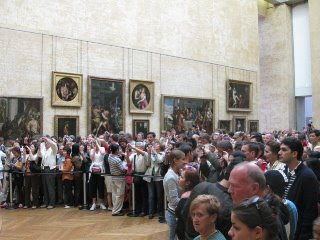 Unfortunately the place was mobbed and we weren't able to get many photos as shown here. During his four month stay in San Diego, Larry will be reporting back to us on the San Diego and Los Angeles art scenes. My first 11x14" contact print! The detail in this image is incredible and clearly cannot be appreciated in this web scan. I really like working with this format. It's a little cumbersome when exposing the negative, but everything after that is standard operating procedure. I process the negatives one at a time (for now) in a Jobo 3062 drum with no insert, using one liter of chemistry per sheet. The negatives themselves are something to behold. 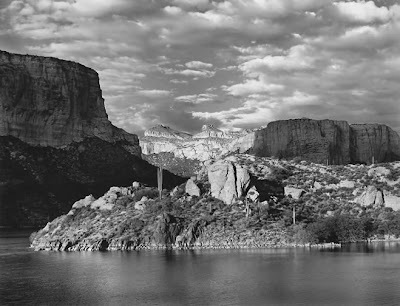 I remember when Randy Efros showed us one of Brett Weston's 11x14 negatives... all I could think of was making my own. Last week I printed my next two 11x14" images. Once I dry-mount them I will photograph them and post them here. I plan on selling my 11x14" contact prints as limited editions of 14 with 3 artist's proofs. Pricing will start at $400 ($200 below my regular price for 11x14" enlargements) for the first four prints. Prints 5-10 will be $500 and the last five prints will be $750. Buying early in the edition is encouraged. These images may also end up in portfolios of 11x14" contact prints at a later date, but they will be denoted as such. A visitor! Hoo could it be? After dinner Sunday night I looked out the back window and couldn't believe it. 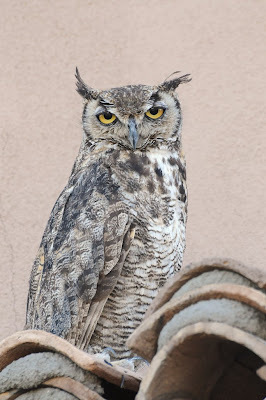 There was a Great Horned Owl sitting on our fence. As I'm sure you all know, owls are usually noctural, so it's rare to see them at this hour of the day, especially in a populated area. Anyway, I took about 60 or so shots with the D300 and a 300mm lens. UPDATE: Tonight after dinner I heard an owl "hoot". I look out my office window and there it is just setting down on our back fence again. As soon as I saw it, it flew away. Then I go into the kitchen and see another one, much larger, sitting in our pool on the first "step". I open the back door to get a better view and I see the other one fly off our roof. We must have a mating pair who like our house. I hope so... they can take care of the field mice and chipmunks who leave their business all over the place out here. 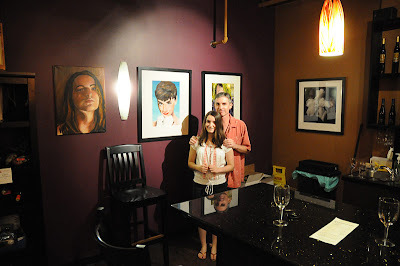 Lindsay and I had our artist's reception at the Su Vino Winery show last Thursday. 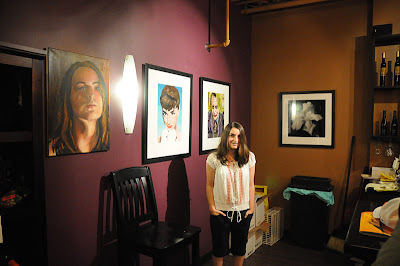 The owners were very pleased with the show, especially Lindsay's work. I gave her the prime wall spots at the end of the bar. A lot of people showed up, but as it was about 110 degrees outside and it was also the 20th Anniversary of the Summer Artwalks in Scottsdale, most of them were looking for free door prizes. Many members from Imageworks showed up and we thank them for their support. 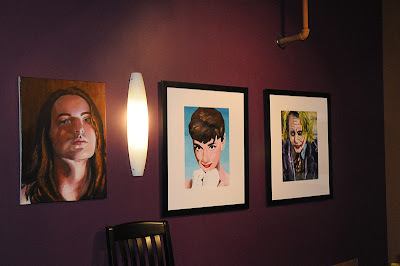 Lindsay's paintings in the prime location. 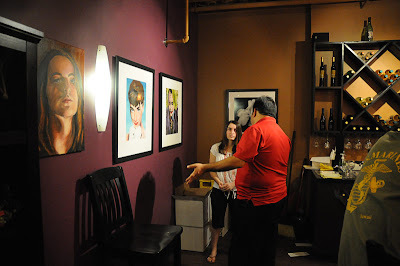 My friend, Juan Garcia, also an accomplished painter, talking about painting with Lindsay. The show is up until August 4th. If you are in the area, please stop by and let us know what you think. As it will be hot for a while, why not order a flight of wine while you're there! Su Vino is located at 7035 E. Main Street, Suite 110,Scottsdale, AZ 85251 (480) 994-VINO(8466). 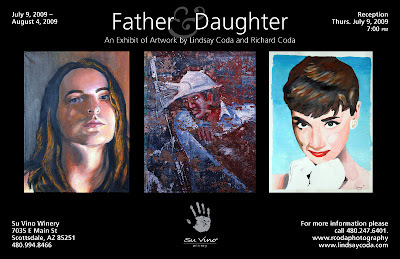 I will be exhibiting with my daughter, Lindsay, at Su Vino Winery in old town Scottsdale from July 9 through August 4, 2009. There will be an opening reception on Thursday, July 9 at 7:00 PM. This also coincides with the 20th Anniversary of Scottsdale's Summer Artwalks and there will be food and music at many galleries. This is Lindsay's first exhibit (outside of school) and she is very excited. If you are in the area, please stop by and support her. Su Vino Winery is located at 7035 E. Main Street in Scottsdale (at Marshall Way). Their phone is 480.994.8466. When I was a senior in college I found a book at the Whitney Museum in New York that I became fascinated with. 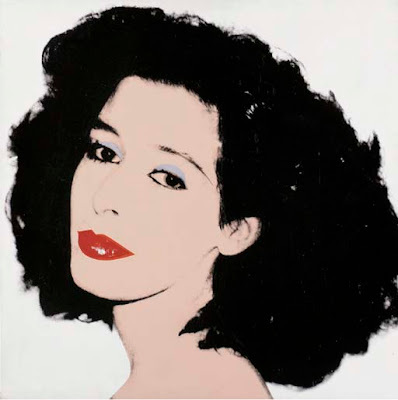 Andy Warhol: Portraits of the 70s. It was the companion book to the exhibit at the Whitney several years earlier. In particular, the image of Gale Smith reminded me of my girlfriend at the time, Sharon. As I had started working with a 4x5" camera at this time I wondered what would happen if I shot with litho (film that printers used to make plates for printing presses) film. 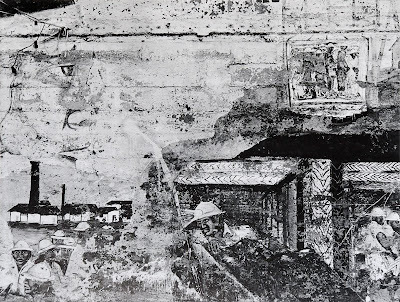 Litho film is inherently high-contrast but it can be tamed to a certain extent by use of low-contrast developers. So, I asked Sharon if she would pose for me and she agreed. I developed the film in Dektol, Kodak's basic print developer. 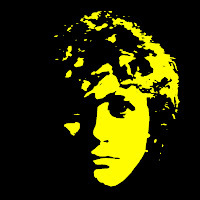 The negative is high-contrast but still has a soft edge to it. I made a print on Grade 5 paper and hand colored it using food coloring and PhotoFlo. The result is below. 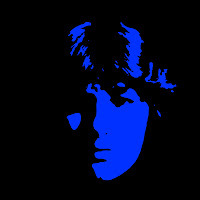 Now, this is SO easy to do in Photoshop or Photo Booth today that it's not even worth mentioning, but it was fun way back when. When school was out I asked my brother and sisters if they would pose for me so I could do something similar as part of a gift to our parents. Below is the result. Well, they say you really can't do that. Anyway, BIG STONES and BIG WATER are always inspiring, especially to photographers. 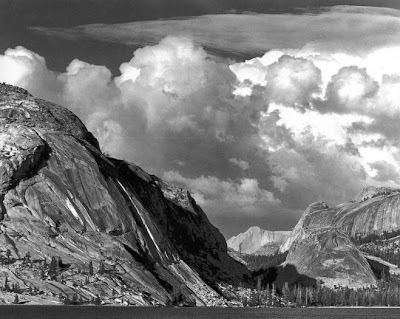 Lately I have found myself yearning for landscapes... I don't know why. Maybe, as I approach 50 (T-minus 1 year) I am seeking some sort of solace from the continuous stream of depressing news that Man generates on a daily basis. 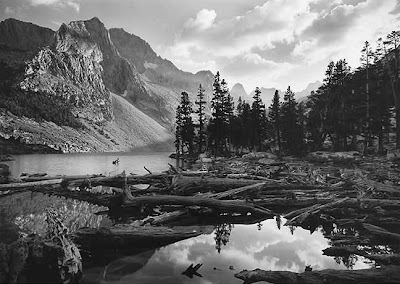 This image, Lake Tenaya, 1946, by Ansel Adams (and a similar image by Edward Weston from 1937, below), has always been one of my favorite landscape images. I haven't taken any landscapes in quite a while so I went through some older negatives that I had never printed in preparing for a print session I had yesterday. After I finished printing new work I went for this negative, which I took on my honeymoon at Jasper Park Lodge in Jasper, Alberta, Canada in 1990. 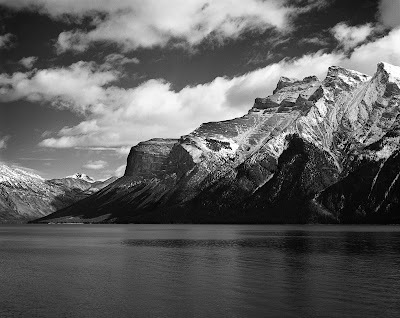 This was a view of Lake Minnewanka. I made an 11x14 print that I think is very beautiful. After making the print I also remembered a print that I have from my friend, Jody Forster. 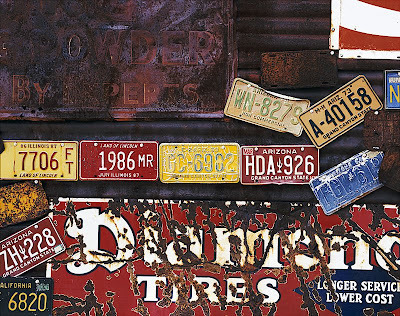 There's a dimensionality in all of them that's just contrary to the fact that they are two-dimensional photographs. These images are so beautiful that sometimes I feel like I could cry. Maybe you can get water from a stone! New work... and old work. I have been developing lots of new negatives the past two weeks and even a few old (undeveloped) negatives from the "vault". I also had a print session today... very productive. Six new 11x14" contact prints (2 images, 4+2), three new 8x10 contact prints, and three old 4x5" negatives that I had never printed before. Also, look for a few new "Inspirations" posts soon. It's [a] great country isn't it? No, I mean country music. My 14 year old daughter has recently become very fond of "country music". I explained to her that she should listen to BOTH kinds of music... country AND western ;^) Anyway, the stuff they call country music today is not country... it's formula. They all sound the same... they all look the same... and I know it's always been like that, but true country music is about some guy with an out of tune guitar, singing about how he's lost the girl of his dreams, with lots of twang and angst in his voice. Lindsay called me from Providence, Rhode Island last night where she is visiting Rhode Island School of Design (we are scouting art colleges... her school told us we should start sophomore year... it was junior year at the earliest when I was in high school). I was in the car driving to a jazz concert when she called. When the call was over I heard the Rolling Stones' "Far Away Eyes" on the radio. I have always told her that this is the Greatest Country Song ever recorded, with all due respects to the greats of the past, including Johnny Cash. 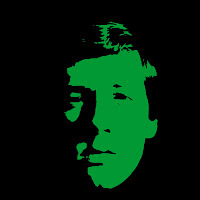 I firmly believe that rock n roll died in 1978. 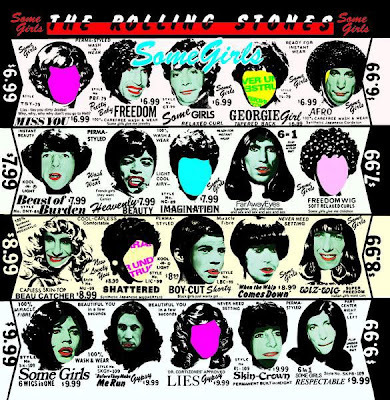 This album [Some Girls] was the last great rock n roll ALBUM ever made. Nothing since can be considered a great ALBUM. I even have the original LP, with the cover before they recalled it because they didn't get permission to use some celebrity portraits. Greatest anything... I'd like to hear from you.